Only a couple of days ago, Arya angered Vijay fans by (unknowingly) hitting out at ‘Puli‘ in the name of promoting his good friend Vishal‘s ‘Paayum Puli‘. Few days ago, Puli versus Paayum Puli fight is hotting up - the lines were drawn and the fans of both, Ilayathalapathy Vijay, and Vishal, are also at it. As it happened, the audio of Puli was also launched on the same day as the other film, with both, D Imman, who has composed the music of Paayum Puli, and DSP, the man behind Puli's songs, heading for their respective audio launches. So now, while the audience will give their verdict on which music scores in mass appeal, here's an incident that has irked Vijay's fans. Here's what happened: it is known that actor Arya and Vishal are good friends. And so, just before the audio launches of both the films were to happen, Arya tweeted, "Verum PULI ellada PAAYUM PULI audio release da. Edhe 'Nuts' edukaade puli da... puraitchi Thalapathy@VishalKOfficial. build up ok va mama..."
Clearly, there were a few very obvious innuendoes here, which no one missed. Also, a little earlier, Vishal had tweeted asking Arya not to come to the audio launch of his film. "Dear jammy @arya_offl pls don't come for my audio launch #PaayumPuli. Lol last time u created a stir. Dis time don't come. Luvu. God bless." Coming right at the time of the Puli audio launch, and Arya being a popular star, this show of camaraderie has obviously not gone well with Vijay's fans. Even Vishal replied to that tweet of Arya's with, "@VishalKOfficial. On da way to #PaayumPuli audio launch. God bless. 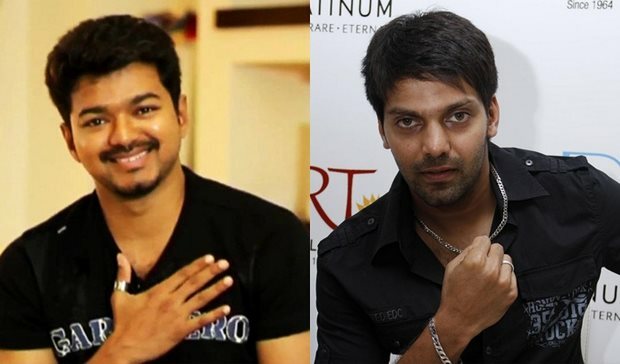 And thnx to @arya_offl Idhukku nee audio launch ke vandhirukalam..."
And now, he has earned the wrath of Vijay fans again, as he appears as Ajith fan in his upcoming film ‘Yatchan’, directed by Vishnuvardhan. Ever since photos of Arya performing ‘paal abishekam‘ to Ajith cut-out and dancing in front of it (for ‘Yatchan’) popped up in social media, Vijay fans are upset with it.